Made from American 304 #4 brushed food grade 12 ga and 14 ga welded stainless steel. The butter churn is all USA made in an Amish factory that makes high-grade food grade equipment for maple syrup and dairy operations. Horizontal 304 food grade stainless steel butter churns are made for small dairy and co-op operations. Variable speed motor is the ideal set up for slow churn processes. Open top design and bottom drain make rinsing out the buttermilk easy and fast. USA Amish manufactured with the integrity to make things that will last for a very long time. Note: The rolling cart pictured is not included. The 15-gallon churn is fabricated from American 304 #4 brushed food grade 12 ga and 14 ga stainless steel. Joints are welded and then ground and polished smooth for food contact and sanitizing. 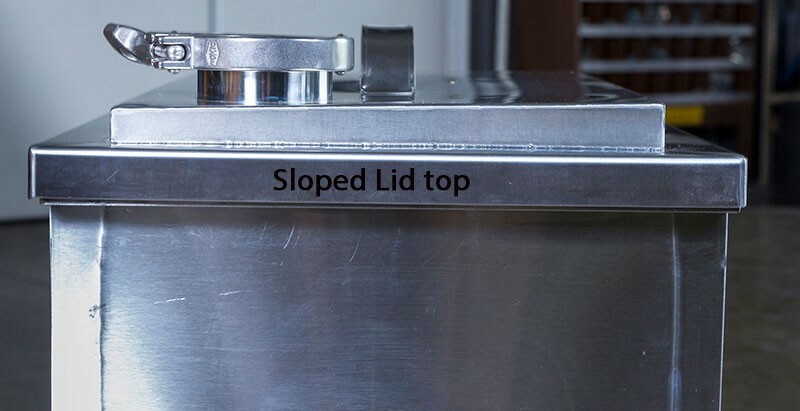 Lid slopes 2° to reduce droplets. 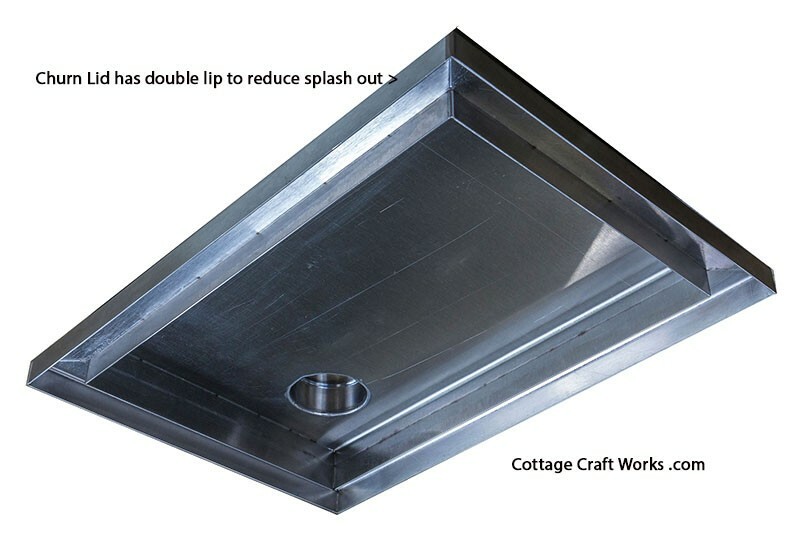 The lid has a welded outside lip plus an inside welded lip to help reduce splash out. Removable sight glass for cleaning secured with food grade sanitary tri-clamp seal and glass cap on the end. 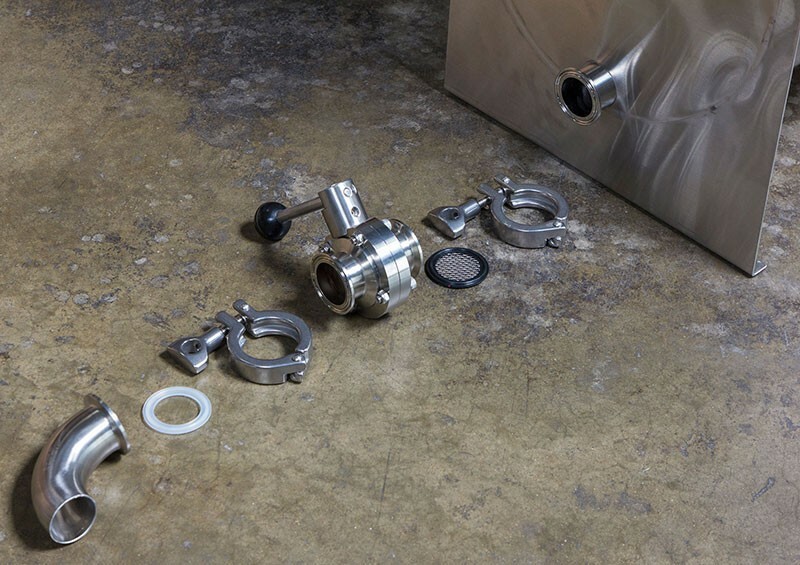 Bottom drain utilizes a sanitary food-grade stainless 1-1/2” butterfly valve with screen and elbow for easier washout. The valve connects to a welded flange to hold a tri-clamp removable connection. Valve and elbow parts disassemble for cleaning. 3/4 HP electric motor with a variable speed controller will begin to make butter in approximate 8-10 minutes. Overall 20-30 minutes for a complete batch. Speed range from 0 up for slow processing and wash out. Shaft bearings are machined from food grade UHMW Plastic used in food grade equipment. 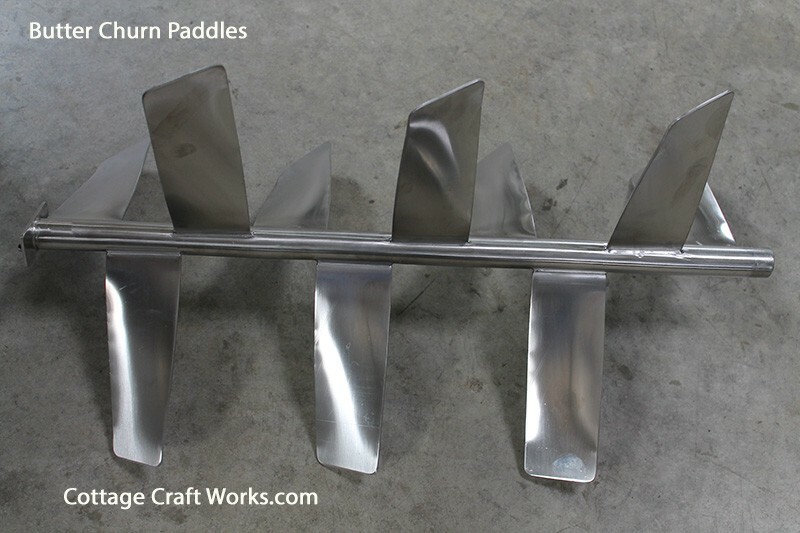 The mixing paddles are made from 12 ga 304 stainless steel welded to a 304 stainless steel rod capped and welded at each end. The mixing paddle assembly completely removes for standard milkhouse equipment cleaning and sanitizing procedures. The front shaft end UHMW bearing slides out of a front welded port allowing the shaft to lift up and out. The bearing shaft front end port is then sealed with a food grade sanitary tri-clamp cap on the end. The motor shaft has a welded flange to hold the bearing housing. The motor shaft utilizes a pressed on UHMW bearing along with a food grade O-ring to prevent the cream from running into the shaft housing. The motor shaft may be removed for periodic inspection by loosening the Lovejoy set screws and pulling into the tub. 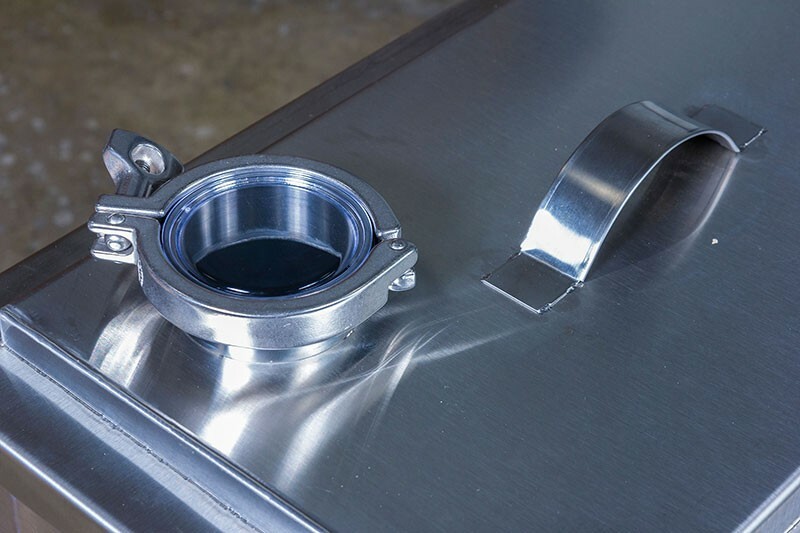 The inside tub shaft to motor flange connection uses two stainless welded flanges with two stainless studs to keep the shaft from free turning. When the mixing paddle shaft is removed the motor shaft flange is separated from the mixing paddle assembly for complete cleaning and sanitizing. Standard churns are wired for US 110-115 volts 60 cycles. A 220 volt 50 Hz motor and controller is available for International use. Inside tub measures 26” Long x 16” Deep x 22” Tall. The 15 gal churn will need to be sent truck freight. Select F.O.B. shipping quote or shipping deposit above using the drop-down box. Shipping deposit is an estimate of what the crating, handling and truck freight will run. We will either refund the difference if the shipping deposit is more or we will contact you for the additional amount if the actual shipping cost is estimated to be 10% higher than the deposit. Each churn is custom made per order; please allow 3-4 weeks for manufacturing and shipping. During the busy maple syrup season, Jan-March custom orders may take 6-8 weeks. Note: For commercial users. 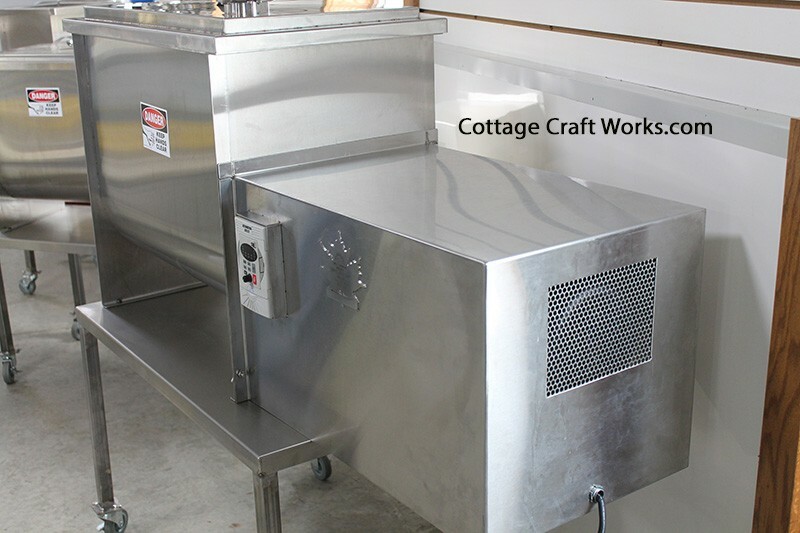 The churn inside is completely made of food grade materials including 304 food grade USA welded Stainless Steel. The shaft bushings are made of food grade UHM high-density polyethylene used in commercial food equipment. There's one food grade rubber seal located on the motor side of the shaft. 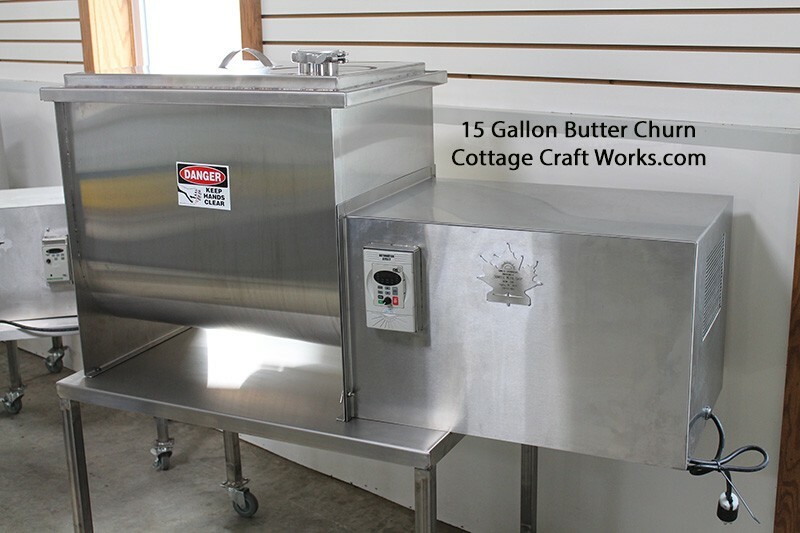 While 3-A Sanitary Standards Committees in conjunction with the U.S.D.A does not appear to have published specific requirements for small batch butter churns at the time of this posting, they do refer to the construction and the type of materials that churns should be made of. For more information see General Specifications for Dairy Plants Approved for USDA Inspection and Grading Service Effective June 29, 2012. § 58.128 Equipment and utensils. § 58.316 Conventional churns. § 58.317 Bulk butter trucks, boats, texturizers, and packers. 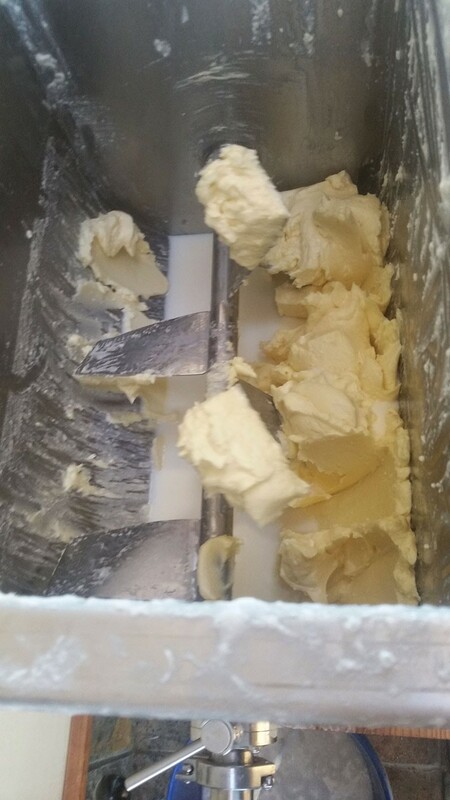 You should also check with your local dairy inspection or health authority for approvals, permits, and other requirements to use a butter churn commercially. For a delicious twist try adding: Honey and cinnamon, fresh parsley, tarragon, and thyme, roasted red pepper and garlic, roasted red pepper and garlic, lemon zest juice, fresh dill. International Customers: We receive many inquiries regarding shipping to the UK and Europe. This churn is wired for US 110-115 volts 60 cycles. A 220 volt 50 Hz motor and controller is available. Contact us for more information. The churn is over the size and weight limit for USPS Priority International. Traditional UPS and DHL rates are very expensive thus, we recommend that International customers work directly through a US forwarding service like Bonvu.com, Bongus.com or many others offering this service at reduced rates. We can then ship to your agent. US freight cost to the agent will still apply unless the agent arranges for F.O.B pickup at the factory in the state of Indiana USA. We also have a 25-Gallon Size now available. Email us for more information.